Pixel Joint Forum: NESsing around FF style. Topic: NESsing around FF style. more final fantasy one inspired sprites. working with NES colours and the black background that was the style of the original game. 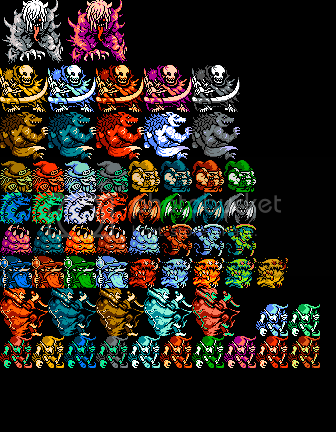 3 colours per sprites except for the boss at the top who has one colour swapped for a 4th on two tiles. Probably aiming for about 3 to 4 palette swaps of the same sprite per character. most design elements for the characters I'm pretty happy with but crits are always welcome, mostly looking for opinions on which palettes to choose for my 3 to 4 picks. Also I'll post the wips here until i feel my bad-guy team is complete. I have names for all of them if anyone is curious, lol. for a random nickname, you anything but random sir. Added a wizard, (after watching LOTR) and edited the witch. i love the final fantasy series, and i love these sir. great jorb! whats with the witch losing shading? That would be the "edited the witch" bit - the less shaded one being the before and the shaded being the edited, im sure. Tweaked the Eel to bring him up to the style of the rest of the team and introduced the Fire Eater class. Added the wizards to the main sheet as well as tweaks to palettes here and there. Also, for no reason at all: introducing Team Purple. Thought that this was a funny colour scheme. Maybe you enter a cheat code and the game is played with these enemies? just for fun lol. I love the fire eater class that you just introduced, but the wizard stands out as my favourite thus far. Intrigued and can't wait to see more. Woah, these are awesome, but they remind me more of Gameboy Color sprites. What's with the witch's changing shading? hopefully More to come, I think I need a few more big bad guys and maybe another boss down the road. I like the green imp with black clothes and stalker with dark aqua. These are very nice, better than original sprites IMO. They´re verrrrrry good.. There´s a spriter, creating a game, called paradise blue, his demo also uses many custom sprites in NES limitations, though i like your better. JosephSeraph: Just making it for the heck/practice of it. I Always make stuff with game ideas in mind, and usually plan the story etc., I just don't have the code know-how to make a game. These are the bee's knees!!! I don't know if anyone's mentioned it yet, but if these sprites would be at all useable, they'd probably have black included in them, making it 4 colors, since, black is included. I'm no expert but most NES sprites I've seen only had 2 'colors' + black + transparency. Yours have 3 'colors', so they slightly deviate from the NES feeling, but despite that, and I might be wrong about it, too, they're really, very, great. But, yeah. It's easier to be amazing with less restrictions. JS: ya, I've heard about it, and did a little research on it a while ago, nothing too thorough though. Best way to contact me is via gmail, same name. MFL: sounds sweet, any more info you can give me on that? Dr. D: actually if you look at the characters in the game, all but 3 of the enemies have at least 3 colours, not including black. If so, then they could have just used transparency over those areas to make it appear like they're using black. But I suppose if you're doing it the same way, it's no problem at all, good work. =] Wizard and Skeleton Warrior are my favorite so far. thats true for all the enemies (like the ones I'm doing above) but they actually did it for the overworld sprites as well. The overworld sprites having 3 colours and black. I've been looking at a couple other games to answer this question and i think you can use up to 3 colours, 1 permanent colour , (say black) and then transparency, I'm kinda new to the technical side of this so i may be wrong, but i've noticed a lot of characters with three colours, black outline and transparency. For example: Koopas from Mario 3, unless they are using some technical trick. speaking of overworld, I will post my own version soon! finally, managed to post some overworld. Juts a doodle/idea for a forest maze area. the centre will have a castle or giant tree, leaning towards castle though. I've also done the map on the 'town' level. I'll post some more later, I even have some villager sprites that can walk around. 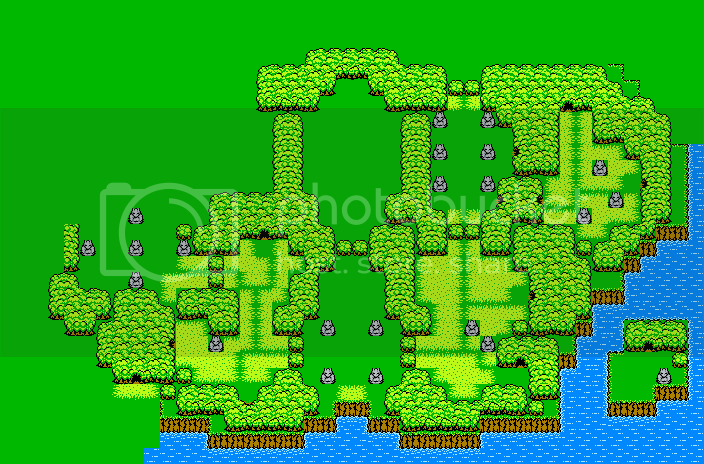 My overworld map is breaking more from the FF style. I have my forest like those in Chrono Trigger, as in impassable save for the tunnels, and i have to say my recent wii download of star tropics has had some inspiration for the map as well. Whoa, that overworld is beautiful. It almost looks too beautiful to be possible on a real NES. Woweee!! You should definitely post some of your work at the forum link I'm about to send you... I'll put in a good word and maybe get you set up with the programmer to see if he can use your stuff!! It's awesome! Colourful work there, looks very neat indeed! To clarify, the NES can do 4 colors per tile. A tile is 8x8. So if you see a sprite with more than 4 colors including transparency, its probably bigger than a tile. Like with Megaman, his armor is 3 colors and transparency, but his face is a different tile. And those sprites look really good, btw.